Reportedly, the Cleveland Browns are working on new contracts for wide receivers Breshad Perriman and Rashard Higgins. CLEVELAND — From trades to a season-ending injury for Ricardo Louis before training camp began, the Cleveland Browns’ receiving corps went through plenty of changes in 2018, but the front office is working to curtail the turnover. According to ProFootballTalk.com, the Browns have begun the process of contract extensions for wide receivers Breshad Perriman and Rashard “Hollywood” Higgins. Perriman joined the Browns prior to their Week 6 game against the Los Angeles Chargers, and despite having little time to acclimate to Cleveland’s offense, he quickly became a down-the-field threat for quarterback Baker Mayfield…and wide receiver Jarvis Landry, too. Perriman turned 16 catches into 340 yards, an average of 21.3 yards per reception, and two touchdowns. Perriman hauled 66 and 63-yard receptions in wins over the Carolina Panthers and Cincinnati Bengals, respectively, at FirstEnergy Stadium. Literally, Mayfield and the Browns came out firing in a win over the Panthers on December 9. On first-and-10 from the Cleveland 25-yard line, Mayfield took a snap under center, faked a handoff to running back Nick Chubb and rocketed the ball down the numbers on the left side of the field, where Perriman had gotten behind the coverage of Panthers cornerback Donte Jackson. Perriman secured the catch at the Carolina 19-yard line and stumbled his way to another 10 yards before being brought down inside the 10. Two plays later, Landry ran in for the touchdown from three yards out. Then, in the next game, Perriman was on the receiving end of a circus-like touchdown reception. Facing a third-and-nine from the Denver 31-yard line, Mayfield muscled the throw down the field toward Perriman. The 6-foot-3 receiver outleapt veteran defensive back Tramaine Brock and high-pointed the ball just short of the goal line. As Perriman fell to the turf, he secured the catch and maintained possession all the way through the play for the touchdown, which included a hard landing and a five-yard roll out of bounds. Against the Bengals, Perriman was on the receiving end of a pass from Landry. The Browns’ second scoring drive of the game covered 70 yards in just three plays in large part because of Landry. On first-and-10 from the Cleveland 30-yard line, Landry took a double-reverse pitch from wide receiver Antonio Callaway and fired a throw to Perriman for a 63-yard gain. Landry’s throw moved the Browns from their own 30-yard line to the Cincinnati seven. Landry caught the pitch while running from right to left across the formation, and then, he slowed to a stop, brought back the ball, found Perriman with a step on a defender and fired the throw to the right side of the field. The throw travelled 54 yards in the air, and then, Perriman accounted for another nine yards after securing the reception. 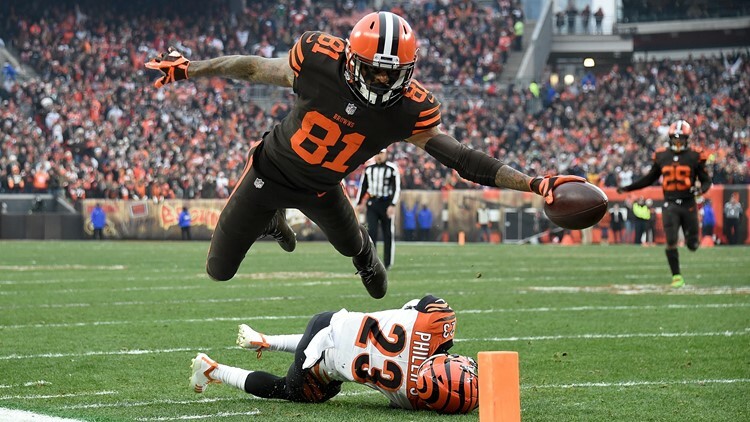 Cleveland Browns receiver Rashard "Hollywood" Higgins dives for a touchdown in front of Cincinnati Bengals Darius Phillips during the third quarter at FirstEnergy Stadium in Cleveland, Ohio on December 23, 2018. A fifth-round pick of the Browns in the 2016 NFL Draft, Higgins had a career year in 2018. Higgins turned 39 receptions into 572 yards, an average of 14.7 yards per catch, and ranked tied for second on the team with four receiving touchdowns. Higgins set new single-season career highs for receptions, yards, yards per catch and touchdowns in 2018. Over his first three seasons with the Browns, Higgins converted his 72 receptions into 961 yards and six touchdowns.